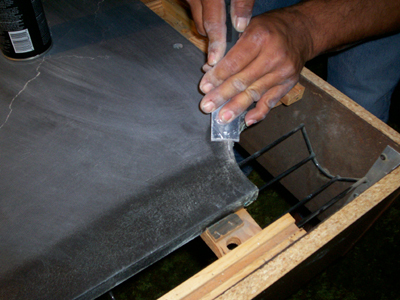 Before refelting over your slate, you’ll need to do some pool table pocket repair and prep. This is short and sweet but must be done. After all, you don’t want anything disrupting your shot! Right? You only need to do a small area because the cushions cover the rest anyway. You can see Allen pointing out the area you need to prep. So! We’re moving on. 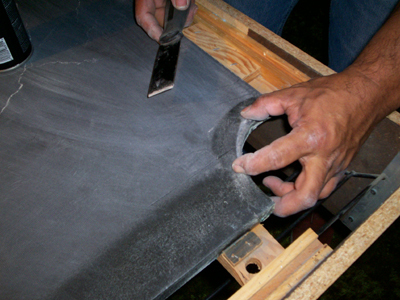 Next we will see the process of refelting the bed of the pool table. It will go quickly from here and have mostly pictures of the process. The final step with the pockets comes after the table is completely refelted and ready for new pocket liners. (You went this far, right? Get new liners, too!) It’s a very simple and straight forward process. Just place the new pocket liner in the pocket and mark it for cutting. Allen just used his utility knife for cutting these. You’ll also have to trim the lower part so that the balls can pass without getting caught up. You’ll get details and pictures of the process at the end.